Polystyrene Beads in solution manufactured aboard the Space Shuttle Challenger during NASA mission STS-6, April 1983. These microscopic beads are so small that 18,000 could fit on the head of a pin. They are used for the calibration of particle size measuring instruments including optical and electron microscopes. It was used onboard space station MIR to prevent cosmonauts from possible static discharge while working station on equipment. This Soviet Flag was flown for 95 days onboard the Soyuz & Salyut Spacecraft and was hand signed by flight engineer Georgi Grechko and cosmonaut Yuri Romanenko. Genuine FLOWN piece of the Space Shuttle. 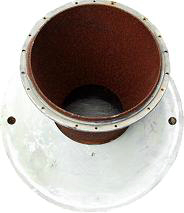 This part was used during take off on the Booster Separation Rocket Motors. (It still has the NASA Identification number on it ). This is a Real Piece of U.S. and world history. It is believed that a similarly shaped O-Ring caused the first Space Shuttle disaster. This Nozzle is from a FLOWN Space Shuttle Booster Separation Motor. Approximately two minutes into flight, 16 of these small but powerful motors execute split-second timing to provide the precise thrust required for safe separation of the spent boosters away from the main fuel tank and orbiter. A Real Piece of space history. This is a piece of Silica Aerogel, the same type used in the Mars Pathfinder Rover. It is 99.8 % air. Aerogel's are generally known for being an extremely lightweight transparent solid. It can support 1000 times it's own weight & resist hi-temp. 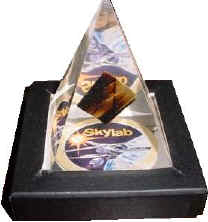 This is a FLOWN 1" x 1" piece of Skylab displayed in a beautiful Lucite pyramid. Skylab was America's first space station, launched into orbit on May 14, 1973 and was manned for over 171 days. It re-entered the Earth's atmosphere on July 11, 1979, scattering debris mainly over the Indian Ocean. This is a Real Piece of history. 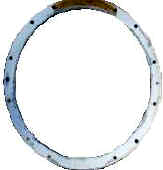 Genuine FLOWN Space Shuttle Main Engine Fuel Supply spacer ring. NASA has eliminated (Scraped) this piece of hardware due to failure to meet specifications after post-flight inspection. This is a Genuine NASA Apollo Lunar Module Gold Mylar Thermal Radiation Blanket. It is 7 1/2 inches long by 4 inches wide and has an identification number that reads: GP 15C-1. It was going to be used to protect delicate instruments on the Lunar Module Vehicle. Genuine FLOWN 16mm film which was taken on the Lunar surface by Apollo 12 on November 18, 1969. 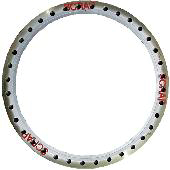 It was made using the Apollo Data Acquisition Camera which is manufactured by the J.A. Maurer Corporation. This is an original, 1950's era NASA Ultra High Frequency Disc-Cone Antenna Assembly. It was used for spacecraft tracking during the Mercury, Gemini and Apollo space programs. Portable Space Suit Cooling Unit. This is a portable Space Suit Cooling Unit. This device cools the pilots while they are on the ground waiting to get strapped into the cockpit. It uses liquid oxygen to cool the suit.